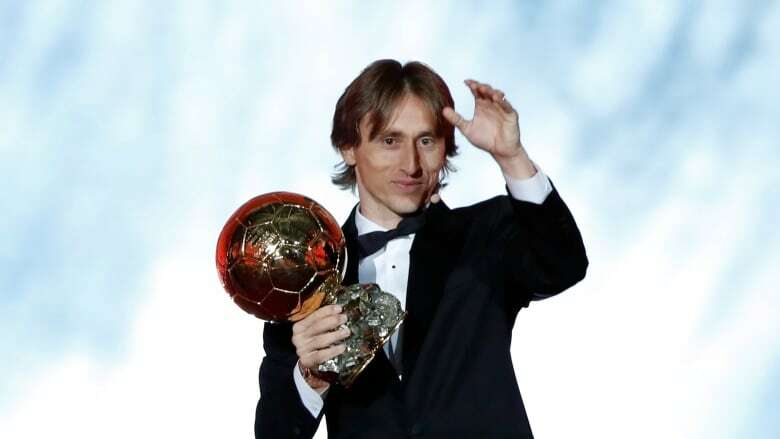 Real Madrid midfielder Luka Modric won the Ballon d'Or award for the first time on Monday, ending the 10-year dominance of Lionel Messi and Cristiano Ronaldo. Luka Modric won the Ballon d'Or award for the first time on Monday, ending the 10-year dominance of Lionel Messi and Cristiano Ronaldo. Modric won the Champions League with Real Madrid and then guided Croatia to the World Cup final in July. He was voted player of the tournament. "As a kid we all have dreams. My dream was to play for a big club and win important trophies," Modric said. "The Ballon d'Or was more than just a dream for me and it is really an honour and a privilege to hold this trophy." Ronaldo was second in the Ballon d'Or followed by France forward Antoine Griezmann. France's teen star, Kylian Mbappe, was fourth in the polling. Brazil star Neymar, who was third last year, was a lowly 12th despite a domestic treble with Paris Saint-Germain. Also, Norwegian forward Ada Hegerberg won the inaugural women's Ballon d'Or. Modric, who has won the Champions League four times with Madrid, was fifth in Ballon d'Or polling last year. "2018 is a dream year for me," the 33-year-old Modric said. "Throughout my career I realized hard work, persistence and belief in yourself in difficult moments are the foundations of success." Modric's father was shown on the big screen during the ceremony at the imperious Grand Palais in Paris, wiping away tears. Ronaldo also won the Champions League last season with Modric, before leaving to join Juventus. He scored a hat trick against Spain at the World Cup but he failed to make an impression when Portugal lost to Uruguay in the round of 16. Mbappe and Griezmann scored in the 4-2 World Cup final win against Croatia. Mbappe won the domestic treble with PSG, while Griezmann scored twice for Atletico Madrid in the Europa League final win against Marseille. Messi was fifth in the voting, having been runner-up to Ronaldo the past two years and in the top three every year since 2007. Modric had never previously been in the top three. The previous oldest winner was central defender Fabio Cannvaro, who was also 33 when he won it in 2006 after helping Italy win the World Cup. The 19-year-old Mbappe — the youngest player to score in a World Cup final — also won the Raymond Kopa Trophy awarded to the best young player. Taking a stand against what she describes as a lack of respect for female players in Norway, she hasn't played for the national team since it crashed out of the group stage of the Women's European Championship in 2017 without scoring a goal.